83 West offers two unique dining experiences to accommodate all guests. 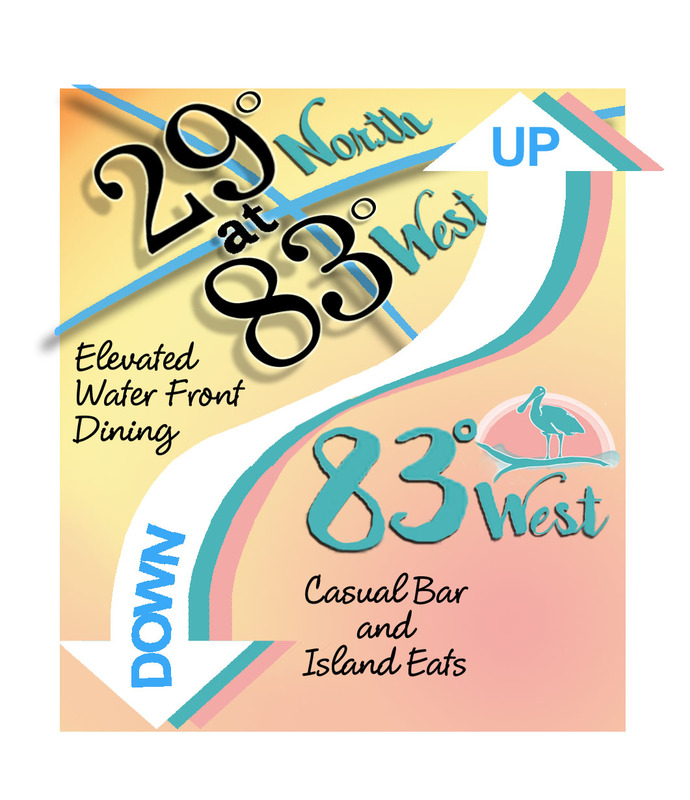 83 West Downstairs is a casual counter and bar service experience with casual food and bar featuring 16 beers on tap, and three pool tables with indoor and (dog friendly) outdoor open-air seating with panoramic gulf views. Seasonally, there is live music on weekends. No reservations required. 29 North at 83 West is the "elevated" refined casual dining experience located above 83 West. This dining experience is offered on weekends seasonally. This experience is full service dining with a full bar featuring separate lunch and dinner menus, as well as a raw bar. 29 North at 83 West also has 270 degree panoramic views of the Gulf of Mexico, is ADA accessible with an elevator, and can also accommodate large parties and even private and special events upon request. Reservations are strongly encouraged for 29 North at 83 West. Both 83 West and 29 North at 83 West are chef-driven and items are freshly prepared with seasonally and locally-sourced products. All meats are high quality and ethically sourced, seafood is wild-caught and quality sourced, and all food items are locally sourced whenever possible.